They should have hit back him in the Democrat primary. It might not have stopped him, but it could have run up the bill. He spent directly though his campaign account and through the state party account ~$32 million to put down Cynthia Nixon. I can see that “red flag” bill passing even if the Republicans retain control. It depends how much pressure Governor Cuomo puts on them. I am voting for Larry Sharpe for Governor and encourage all other 2A supporters to do so as well. I do not believe Marc Molinaro is a bad guy, but his gubernatorial campaign is a farce and I’m not going to be a part of that nonsense. One might be able to look past his running mate Julie Killain’s anti-gun advocacy and even Molinaro himself saying he does not want help from the NRA provided that you believe he and the Republicans actually want to replace Andrew Cuomo as Governor. The notion that only Molinaro can beat Cuomo might be true if both he and the party were making a real effort to do that. They are not. Running as a “moderate” Republican who can appeal to both Democrats and independents has not worked. Killian herself has brought nothing of value with her. There is little genuine enthusiasm for the ticket and the campaign is worse off now than Astorino/Moss was four years ago. Meanwhile a big chunk of Molinaro’s campaign funds has been spent on consultants. Given his poor standing in the polls this money clearly could have been better spent elsewhere than getting bad advice from a bunch of GOP political hacks. Knowing this it is understandable why big time Republican donors are staying away. The final straw comes from the Senate Republicans who have left Molinaro out of their messaging. The only reason I can think of for them to do this is because they do not believe associating with the campaign would be beneficial to their own re-election prospects. If elected Republicans don’t support Molinaro’s campaign why should anyone else? As for Sharpe, the Libertarian Party has been rightly criticized for running crackpot candidates and paper campaigns. Sharpe’s campaign is the first in the state to engage in the same serious campaign-building activities that the major party’s do: figuring out how to raise money, organize volunteers, create events and interact with the media. Sure he doesn’t have the resources that Governor Cuomo has, but neither does Molinaro so that is no reason not to support him. It is fair to say that Sharpe has no public record on the issue, but the vast majority of candidates running for office don’t either. You have to base your decision on candidate questionnaires and public statements. It is also fair to say that Sharpe is running to get the 50K votes needed to secure ballot access for the party. So? The Conservative Party has been endorsing gubernatorial candidates for years who are by no means “conservative” for that very same reason. The New York GOP is not a functioning political party. They have no agenda other than self preservation. There is no reason to perpetuate the notion that the only way to protect 2A rights is to vote for their candidates no matter who they are or what they do especially when they show open contempt for gun voters. It is time to change the dynamic. A vote for Larry Sharpe is the first step in doing that. 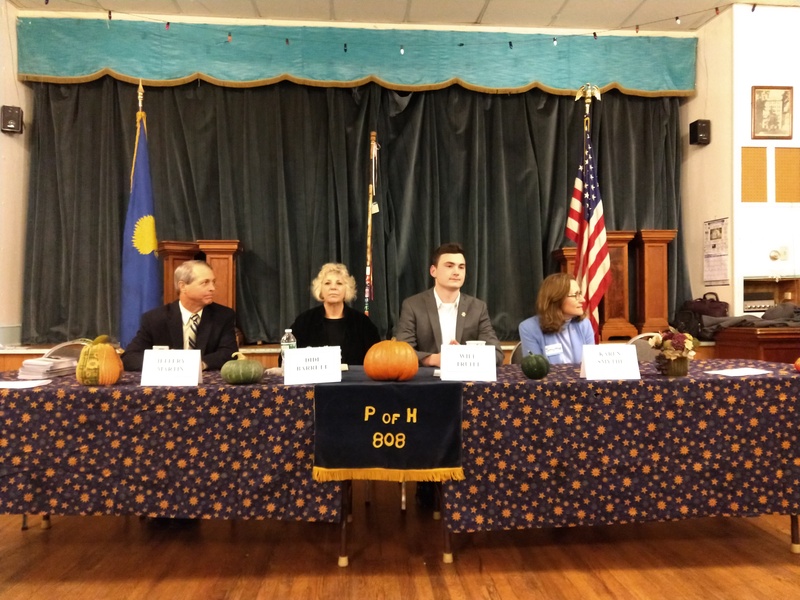 Stanford Grange #808 held a Meet the Candidates event last night. Those which bothered to show up included Jeffrey Martin, Assemblywoman Didi Barrett, Dutchess County Legislator Will Truitt and Karen Smythe. I asked the legislative candidates to state their position on current legislation to repeal the SAFE Act (A-5599/S-1997). Both Barrett and Smythe are antigun, but I wanted them to say so in public.